Although second hand smoke may not seem so obvious on a day to day basis, however, smoking has a very real effect on those around you. Second hand smoke is the worst side effect of smoking of social smoking. 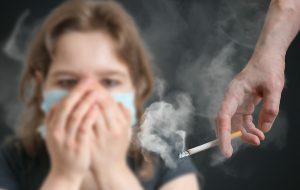 Second hand smoke is dangerous to anyone who breathes it in because it often stays in the air for several hours, long after the smoker has left. Over time, second hand smoke has the same impact on others that smokers may experience. This includes lung cancer and respiratory problems and can impact not only your family, but also your coworkers and neighbors. Most people are not aware that the nicotine in e-cigarettes can be, and is, absorbed through the skin of those around you. Scientists are now linking e-cigarettes to all the same illnesses as smoking cigarettes, but in younger patients. Do not smoke e-cigarettes around babies and children. Aside from the health effects that can have an impact on your family, smoking also has severe financial repercussions, still ‘how to get someone to stop smoking’ remains a puzzle for many. The truth is, if you smoke one pack of cigarettes a day for ten years, you will “burn up” $100,000. Imagine what you could spend $100,000 on! When you quit smoking, notify your Super Fund. Your premiums are reduced when you successfully quit smoking!? The impact on others of smoking covers both domestic and commercial spheres. Smoking at work means your coworkers and colleagues being impacted by your behaviour. Smoking can decrease productivity. Plus smokers often have health complications which result in more time off compared to that of a non-smoking colleague. Are you close to a loved one who is struggling everyday with ‘how to get someone to stop smoking’? Trying to help someone who has given up on quitting can be a trying, frustrating and upsetting time. Maybe they’ve lost hope in ever finding a solution that will work. Well, it’s time to reach out to them and suggest something new. Quit smoking hypnotherapy may appear an out-of-the-box solution. However, with a 95.6% quitting rate, it effectively delivers results. If you want to reduce the impact on others that smoking has while minimising the economical and health implications associated with smoking, download the quit smoking pack on our website, get in contact with us, or call us on 1300 64 53 54 today.